The goal of this challenge is simple. To embrace the slow fashion movement by embracing quality instead of quantity, and finding ways to make a few pieces of clothing, a variety of different and diverse outfits. By focusing on colours, textures, and ethically-made accessories, we will take 8 ordinary garments and turn them into extraordinary outfits. Stay tuned for our report on The Slow Fashion Challenge (summer edition) and see how we have incorporated pieces from our collections in order to take a simple outfit – and turn it into a head-turner! How do you ensure stable money movement in an unstable region? A fashion company based out of Sierra Leone is trying to bring the digital currency, Bitcoin, to the sub-Saharan country by accepting payments via payment processor BitPay. The motives behind this move are to ensure remittances to the continent can flow easily and the unbanked find easy access to money quickly and freely. In a country where the national currency is unstable, a great hurdle to cross-border trade, this could be a solution. While adoption of this concept has been slow in West Africa, South Africa and Kenya have both seen the development of now established Bitcoin economies. The global remittances industry is now worth over $500bn a year, with $60bn alone going to Africa in 2012 due to countries such as Kenya. Its innovative solutions such as this that may help solve some large scale problems in volatile regions around the world. The last few months have been exciting for ethical business in Canada. From green bonds to the largest B corp in the world, Canada is slowly makings its place in a new ethical business environment. With green bonds* seeing another record quarter and a rise in interest from investors, Canada has continued forging ahead with Export Development Canada’s (EDC) latest issue of green bonds. Moreover, Canada’s Business Development Bank (BDC) is now the largest company in the world to be certified by B Labs as a B Corp**. The BDC is Canada’s first financial institution to receive the status and the country’s 100th B Corp. Additionally, Canadian “clean capitalism” magazine, Corporate Knights, has released its annual Best 50 Corporate Citizens in Canada (in addition to a foreign company list, a list of Canadian companies separated by industry and an analysis of resource productivity amongst Canadian companies) and the first-ever Green Provinces and States Report Card (and a corresponding American list). The corporate list, made up of large corporations, was topped by Mountain Equipment Co-op, the Vancouver City Savings Credit Union, Bombardier and Tim Hortans. Meanwhile, the Canadian provincial list was topped by British Columbia, Prince Edward Island and Quebec. All these developments are definitely steps in the right direction, we can only look forward to even more growth in the ethical fashion industry and in ethical business overall. TORONTO, Canada – Coco Chanel once said: “Fashion is not something that exists in dresses only. Fashion is in the sky, in the street, fashion has to do with ideas, the way we live, what is happening.” As our world changes socially, environmentally and economically, our ideas and lifestyle choices as consumers and global citizens have begun to change as well. This shift raises many questions about the sustainability of our current fashion industry practices, what this will mean for young people, and what we should be doing to ensure a more viable and innovative fashion industry for our future generations. With recent global incidents such as the Rana Plaza building collapse in Bangladesh, dramatic climate shifts and increasing conflict over natural resources – sustainable fashion and ethical business models are transforming from a niche to a necessity. The Rana Plaza Building collapse that occurred in April 2013 was a tragic way to bring to light the situation many workers face in some of the leading garment producing regions of the world. With limited workers’ rights legislations and poor enforcement of these regulations where they do exist, working conditions are extremely unsafe. Furthermore, low wages and a lack of direct market access lead to workers receiving little remuneration for the garments they produce, while large retailers earn hefty margins. These conditions further the poor quality of life and future prospects while increases inequality among workers. The results of these practices is a fast fashion retail strategy that focuses on bringing trends to the market in the most efficient way, which brands such as H&M and Zara have embraced. Current fashion industry practices have led to global resource depletion and other irreversible damage to the environment. Considering that it takes 20,000 litres of water to produce 1kg of cotton, equivalent to a single T-shirt and a pair of jeans, the depletion of natural resources such as fresh water is foreseeable. The drying up of the Aral Sea in central Asia, widely considered “one of the planet’s worst environmental disasters,” can largely be attributed to the fashion industry. Once considered one of the four largest lakes in the world, the body of water has shrunk by three quarters since the 1960s, gravely impacting the livelihoods of those who rely on the lake for fishing and agriculture. This tragedy is the result of decades of uncontrolled irrigation by cotton farmers in Uzbekistan, one of the world’s largest cotton exporters. Resource depletion is not the only harmful effect of fashion production. Fashion supply chains have led to the usage and dumping of toxic chemicals, cruel treatment of animals in producing fur and leather, and millions of tonnes of unwanted textiles ending up in landfills each year. The basic premise for all conflict is inequality. The inequality is perhaps most evident at pictures of Rana Plaza, where clothing with popular brand labels can be identified scattered amongst the rubble. The pressure and unrest that is resulting from the depletion of resources and growing inequality is increasing the instability in many already volatile regions. Global outcry and action against the damage done by the fashion industry has led to a focus on sustainable and ethical fashion. For Lejeune: “Ethical fashion represents an approach to the design, sourcing and manufacture of clothing which maximises benefits to people and communities while minimising impact on the environment.” By work towards poverty reduction, sustainable livelihood creation, and minimising or counteracting environmental concerns, the movement is transforming our approach to production and consumption. Sustainable fashion requires numerous stakeholders to build the ecosystem necessary to penetrate mainstream fashion. These stakeholders include not-profit organizations providing resources, advocacy and other support, governments creating the regulation necessary to encourage ethical enterprise, fashion retailers and consumers. Respect for the environment is an integral part of H&M’s business and we work actively to limit the impact that our business and that of our suppliers, stores and logistic centres have on the environment. The company created a sustainability strategy in 2009, which includes broad commitments such as being “climate smart”, adopting the “reduce, reuse and recycle” philosophy and strengthening communities, as part of their Conscious campaign. These goals are being translated into tangible actions, which included donating 3,555,687 garments to charitable causes in 2013, using 340 million fewer litres of water in denim production last year, and being the first brand to sign the Accord for Building and Fire Safety in Bangladesh. Is it Sustainable Fashion Sustainable? 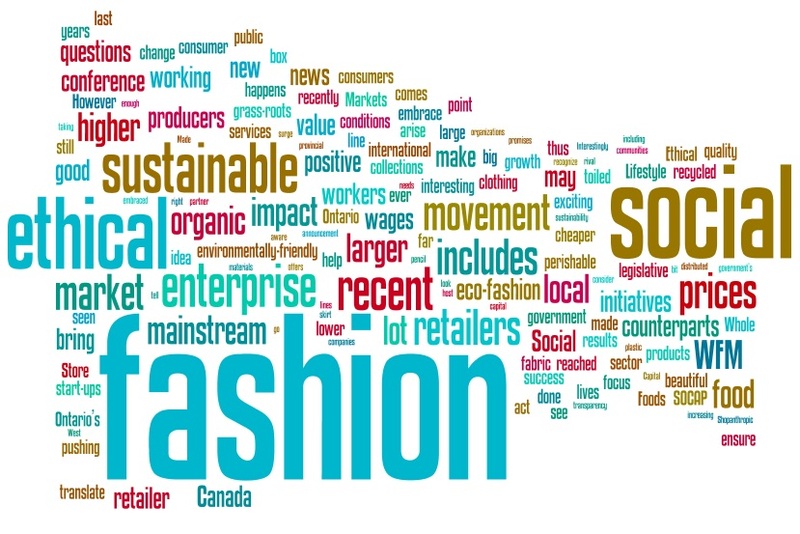 As with all disruptive ideas, sustainable fashion is facing a number of criticisms, which include questions over the viability of the business model, the true motivations of large brands embracing sustainability agendas and whether it is possible to quantitatively measure sustainability. While Lejeune recognised that there are “incredibly pioneering and inspiring” ventures taking very critical first steps, the movement clearly requires growth. According to her, this growth must include a shift in thinking when it comes to the fast fashion model, more collaboration within the industry and more accountability from retailers. One key gap Lejeune identified is an absence of global governance, as regulation tends to vary enormously from nation-to-nation, resulting in a lack of standardised benchmarks to measure the impact of ethical fashion initiatives. There have been efforts to bridge this gap through engaging independent auditors, building databases for best practices, conducting research and developing financial reporting standards that measure a triple bottom line of financial, environmental and social impact. In fact, both Nike and Puma now release triple-bottom line accounting reports to transparently present their ethical impact each year. If we do not change our behaviour – our future generations could see a world where workers continue to be exploited, resources become even scarcer leading to more irreparable damage and conflict, and profits are more important than values. However, we could reverse this trend if we focus on the triple bottom line, by ensuring that the processes we use in supply chains are ethical. Fashion development is supposed to be a creative and aspirational process. With the industrial revolution and a focus on mass production, much of this changed. Creativity was replaced with efficiency and quality with quantity. Our future should not and cannot be that. Our future should be one where people consume less and value the items they consume more, all companies adopt a vision of sustainability and the supply chain becomes an empowering and inspiring process. What can we, as consumers, do to work towards such a future? Educate ourselves on the supply chain process for our favourite brands. Support ethically-conscious and sustainable brands. Consume less and consider upcycling, recycling and reusing our garments. As our climate changes, our political values evolve, our economies see turbulent shifts and our social consciousness progresses – these changes must and will transcend into our ideas and discussions around a more sustainable fashion industry. “For some occasions, your hefty work tote is just not the right kind of bag. We’re talking formal events, such as weddings, cocktail parties, a night at the opera — or anytime you’re going to a crowded bar with the potential to be stuck in that tight spot by the door to the bathroom. The trouble is, you’ve come up with a use for every inch of that space in your tote, and now it’s hard to imagine going anywhere without your Clarisonic. Or, on the more practical side, what are you supposed to do with things like umbrellas? I, for example, can’t live without my bottle of water. I have this horrible fear that I’ll get stuck somewhere without water and dehydrate or have a coughing fit. And a bottle of water definitely does not fit in the average evening bag. This is compounded by the fact that you need a lot of these things for the workday, so if you’re going out straight from work, you often have no choice but to sport your bag lady look with pride. I’m here to tell you there is a solution: the clutch. You’ve heard of it. A clutch is really any purse without a handle, although envelope clutches are the style of the moment. It looks more chic than a cross-body purse and fits into your day bag for an easy transition from day to night. Sure, you’ll be sans provisions for the evening, but you won’t regret it. We couldn’t agree more! Choose the perfect clutch and it makes a perfect outfit, a perfect day or a perfect evening out. In a recent article on treehugger.com, the author argued that “Fast fashion will never be sustainable, no matter what companies say”. It’s impossible to produce ethical, eco-friendly clothing at the quantity and rate that fast fashion demands while maintaining genuinely high and environmentally sustainable standards. – Support smaller companies, since they are likely to have an easier time tracking the source of their product that companies with high volume. – Shop at private businesses or buy from a seamstress or tailor. – Seek out pieces that are made locally or domestically. – If possible, buy high quality items; they’re more likely to last, and you’re more likely to take care of them. – Buy clothing and footwear that is repairable. – Buy second-hand from a thrift store, as those items have proven their durability. – Make do with less clothing. Resist the urge for novelty and keep the same clothes as long as possible. – Do a clothing swap with friends instead of shopping. It is increasingly important and difficult for consumers to identify which companies are trying to minimize their footprint and improve their supply chains, and which are “hopping on the eco-friendly bandwagon only to look better”. If we can successfully do so, we can revolutionize the way we consume.